Using density functional theory and quantum Monte Carlo calculations, we show that B12H n and B12F n (n = 0 to 4) quasi-planar structures are energetically more favorable than the corresponding icosahedral clusters. Moreover, we show that the fully planar B12F6 cluster is more stable than the three-dimensional counterpart. These results open up the possibility of designing larger boron-based nanostructures starting from quasi-planar or fully planar building blocks. The icosahedral B12H122- cluster is the most stable molecule among the number of polyhedral boranes synthesized so far . A large-scale and efficient synthesis of fully fluorinated boron hydrides, e.g., icosahedral B12F122-, has been also reported . On the other hand, the all-boron C3v-B12 cluster is quasi-planar, and it was reported to be one of the most stable all-boron clusters. 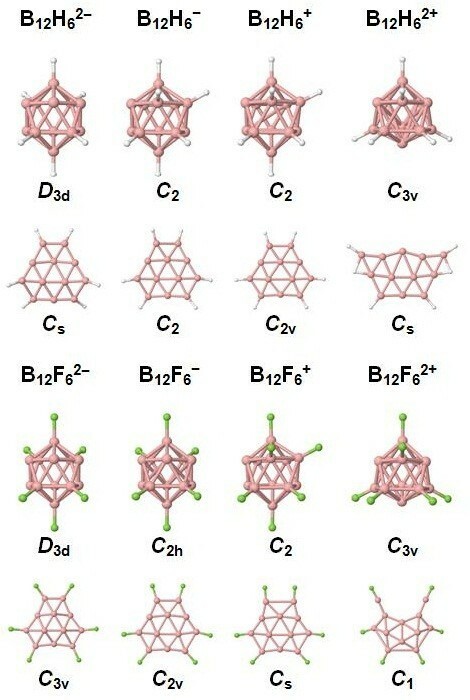 It was also established by extensive computations that the quasi-planar B12 cluster is much lower in energy than the all-boron icosahedral B12 cluster. This was reported not only for the neutral clusters , but also for the charged ones . It is then interesting to investigate what happens with the relative stability of the two (quasi-planar and three-dimensional (3D)) all-boron structures upon addition of hydrogen or fluorine atoms. This is the purpose of this study. Quasi-planar and 3D boron clusters with the number of hydrogen atoms smaller than the number of boron atoms have been studied both theoretically [5–11] and experimentally [12–14]. Ohishi et al. reported the formation of B12H n + (n = 0 to 12) cationic clusters through ion-molecule reactions of the decaborane ions (B10H n +, n = 6 to 14) with diborane molecules (B2H6) in an external quadrupole static attraction ion trap. The mass spectrum analysis revealed that among the B12H n + clusters with different hydrogen content n, the B12H8+ molecule was the main product. 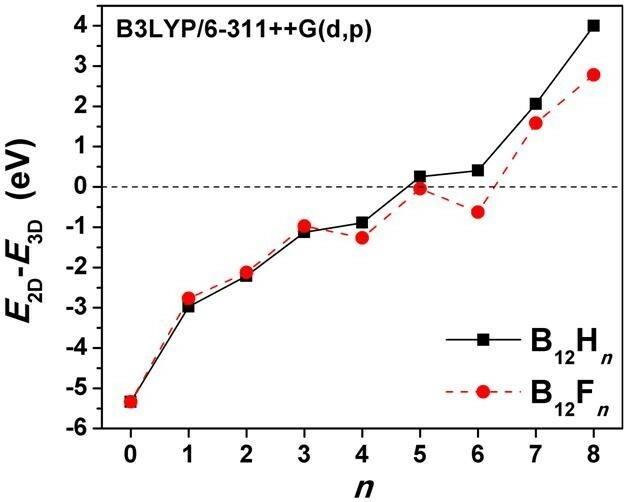 In the same study, using first principle calculations with the Becke 3-parameter Lee-Yang-Parr (B3LYP) hybrid functional and the 6-31G(d) basis set, the authors compared the relative energies of quasi-planar and 3D B12H n + clusters with n varying from 0 to 12. According to that study, two-dimensional (2D) clusters with n = 0 to 5 are energetically preferred over the 3D structures, whereas 3D clusters are energetically favored for n ≥ 6. In a more recent combined experimental/theoretical study, Ohishi et al. suggested that quasi-planar B12H n + with n = 0 to 3 clusters can be obtained by further removal of H atoms from the decaborane ions. This opens up the possibility of changing the structure of the B12H n + cluster by controlling the number of hydrogen atoms in the cluster. To our knowledge, there are no previous studies on the structure and properties of quasi-planar B12F m clusters. However, the structures of two polyboron fluorides, B8F12 and B10F12, revealing unusual open structures were recently determined . The initial search for the most stable structures of the boron hydrides B12H n and boron fluorides B12F n was done at the B3LYP/6-31G(d) level of theory using the FreeON code  with no symmetry restrictions. For clusters with an even number of hydrogen or fluorine atoms (even number of electrons), the computations were performed for the singlet multiplicity only, whereas doublet and quartet multiplicities were considered for clusters with an odd number of hydrogen or fluorine atoms (odd number of electrons). In the later case, structures with lower multiplicity were energetically more favorable. For the charged structures, a similar analysis has been done, and the ground state was found to have the lowest multiplicity. Next, the low-lying isomers of B12H n and B12F n have been re-optimized using the GAMESS-US code  at the B3LYP/6-311++G(d, p) level of theory, and for the resulting structures, the vibrational analysis has been done to identify true local minima. It is important to mention that the 'bare' B12 icosahedron undergoes distortions after structural optimization and that its symmetry is S2, not Ih. However, we will refer to that structure and its derivatives as icosahedral or 3D. The quasi-planar or fully planar clusters, for a change, will be often labeled as 2D structures. The nucleus independent chemical shift (NICS) values and magnetic susceptibility tensors were calculated using the Gaussian 03 package  at the B3LYP/6-311++G(d, p) level of theory. To obtain the NICS values, we have used the gauge-independent atomic orbital method, and the magnetic susceptibility tensors were calculated using the continuous set of gauge transformations method. The quantum Monte Carlo calculations have been done using the QWalk  package in two steps. The first step involved optimizing the trial many-body wave function by doing variational Monte Carlo calculations. The trial wave function was of the Slater-Jastrow form. The Slater determinants were constructed using B3LYP orbitals, generated using the GAMESS-US code with the previously optimized geometries within the B3LYP/6-311++G(d, p) level of theory. For the calculations, we have used Gaussian basis sets with effective core potentials . In the second step, we have done fixed-node diffusion Monte Carlo (DMC) calculations with the previously optimized trial wave functions. In the computations, we have used a time step of 0.005 a.u. The DMC error bars are about 0.1 eV. The procedure for determining the most stable isomers of B12H n was very similar to that reported in , namely, we started with optimized icosahedral and quasi-planar B12 clusters, and for a given n, we have calculated the total energies of all possible clusters that resulted from adding hydrogen atoms to the vertices of the distorted icosahedron or to the outer boron atoms of the quasi-planar structure; 2D clusters with an even n have been considered in our previous work , and here, we have extended the investigation to an odd n. The energetically most favorable 2D and 3D B12H n structures are shown in Figure 1. The minimum-energy cluster structures of B12F n , shown in Figure 2, have been found by replacing the hydrogen atoms of the low-lying B12H n isomers by fluorine atoms. Interestingly enough, the resulting structures are similar to those found for B12H n . One of the small differences is that the B-F bonds are on average 13% longer than the B-H bonds. The most stable structures of 3D and 2D B 12 H n ( n = 0 to 8) clusters. The symmetry of each cluster is given. The most stable structures of 3D and 2D B 12 F n ( n = 1 to 8) clusters. The symmetry of each cluster is given. In Figure 3, we have plotted the total energy difference between quasi-planar (or fully planar) and icosahedral B12X n (X = H, F) clusters as a function of n, the number of H or F atoms in the cluster. As can be seen from the figure, the quasi-planar clusters with up to four hydrogen atoms are more stable than the corresponding icosahedral structures (a similar result has been recently reported  for B12H n 0/- clusters). The same is true for the fully planar B12F6 molecule, which is 0.63 eV lower in energy than the 3D cluster. The 2D and 3D B12F5 isomers are almost degenerated in energy. From Figure 3, we can also see that the energy difference, E2D - E3D, increases monotonically with n, with the exception of the two 'minima' for B12F4 and B12F6. These two minima may suggest an additional stabilization of the 2D structures over the 3D counterparts due to the presence of aromatic stabilization energy. Energy difference between quasi-planar and icosahedral B 12 X n (X = H, F) clusters as a function of number atoms. Similar results to those presented in Figure 3 were reported for the icosahedral and quasi-planar B12H n + structures . However, in their recent work, Ohishi et al. have used the PBE0 functional instead of the B3LYP functional to determine the energies of the B12H n + clusters. The authors' choice was motivated by the fact that the B3LYP functional may overestimate the energy difference between 2D and 3D structures. To address this problem, we calculated the energy difference between the 2D and 3D structures of B12, B12H6, and B12F6 using the very accurate DMC approach. The DMC E2D - E3D values are -5.13, 0.79, and -0.47 eV for B12, B12H6, and B12F6, respectively, whereas the corresponding B3LYP values are -5.34, 0.41, and -0.63 eV, respectively (see Figure 3). This means that the DMC values are shifted up by a value not larger than about 0.4 eV with respect to the B3LYP values. This, however, does not affect the conclusions that are drawn from Figure 3, since even if we shift up the curves by 0.4 eV, the quasi-planar B12H n and B12F n (n = 0 to 4), and the fully planar B12F6 clusters still remain energetically favorable. As calculated here and also reported in , the fully planar B12H6 cluster corresponds to a local minimum of energy, whereas the D3h-B12F6 structure wins the competition with other 2D and 3D isomers and corresponds to a global minimum of energy. Many properties of the B12H6 cluster have been previously described in , but for consistency purposes, we have repeated some of those calculations at the B3LYP/6-311++G(d, p) level of theory. The highest occupied molecular orbital-lowest unoccupied molecular orbital (HOMO-LUMO) gaps of the planar B12H6 and B12F6 structures are 3.54 and 4.39 eV, respectively, whereas the HOMO-LUMO gaps of the corresponding 3D clusters are the same and equal to 2.73 eV. The B-H and B-F interatomic distances are 1.179 and 1.326 Å in B12H6 and B12F6, respectively. For comparison, the computed B-H and B-F bond lengths in borane (BH3) and boron trifluoride (BF3) are 1.190 and 1.318 Å, respectively. While both 2D structures, B12H6 and B12F6, have similar shape and size, they exhibit quite different magnetic properties that are directly related to aromaticity. First, we have computed the anisotropy of magnetic susceptibility. The values for B12H6 and B12F6 are -208.1 and -125.8 cgs ppm, respectively. The isotropic values of the magnetic susceptibility are -91.9 and -118.2 cgs ppm for B12H6 and B12F6, respectively. These results suggest that the induced ring current is stronger for B12H6 than for B12F6. Similarly, as reported in  for B12H6, the central part of the B12F6 molecule has a paratropic current flowing inside the inner B3 triangle. The antiaromaticity of the inner triangle is, however, smaller for B12F6 than for B12H6 since the NICS(0) values are 3.9 and 13.3 ppm, respectively. A global aromatic current is dominant above the B12F6 (B12H6) molecule since the NICS values are negative, NICS(1) = -5.5 ppm (-3.6 ppm) and NICS(2) = -4.8 ppm (-5.0 ppm), 1 and 2 Å above and below the center of the cluster. To examine the influence of charge on the structure and stability of the fully planar clusters, we have also studied charged 2D and 3D B12X6 (X = H, F) structures. 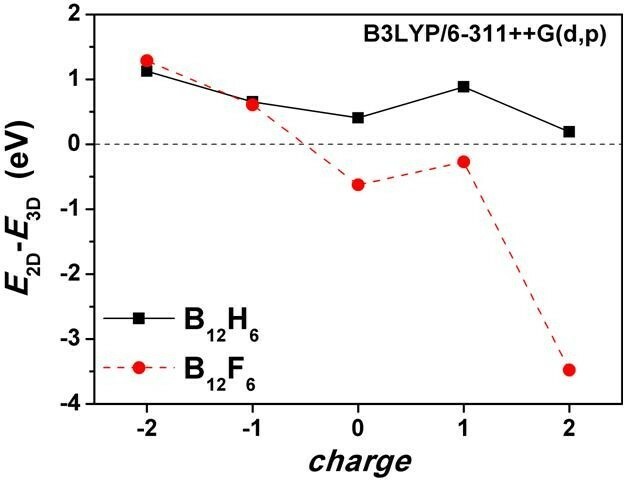 The lowest energy 2D structures identified for B12H6 and B12F6 were used as initial structures for the structural optimization at a given charge state. For the 3D structures, we have made a search over all possible configurations of the hydrogen or fluorine atoms. For the lowest energy structures with an even number of electrons, a singlet multiplicity has been assumed, whereas doublet and quartet multiplicities were considered for clusters with an odd number of electrons. In the later case, clusters with lower multiplicity were energetically more favorable. The structures of the 2D and 3D charged clusters are shown in Figure 4. It has been previously reported that the fully planar D3h-B12H6 cluster undergoes structural distortions if charged with one electron, although the quasi-planarity is preserved . In general, all the charged 2D B12X6 (X = H, F) clusters are quasi-planar rather than fully planar, as can be seen in Figure 4. In Figure 5, we have plotted the energy difference between 2D and 3D [B12X6] q (X = H, F) structures as a function of the cluster charge state q. We have found that the addition of one or two electrons to fully planar B12H6 and B12F6 clusters (or the removal of one electron from them) makes those structures even less energetically favorable with respect to the corresponding 3D isomers. This is, however, less pronounced for B12H6 than for B12F6 as shown in Figure 5. Finally, it should be noted that the quasi-planar B12F62+ cluster is much more stable than its 3D isomer. Finally, all structures and energies are provided in Additional file 1. The structures of charged 3D and 2D clusters of B 12 H 6 and B 12 F 6 . The symmetry of each cluster is provided. Energy difference between quasi-planar and icosahedral [B 12 X 6 ] q (X = H, F) clusters as a function of cluster charge. Our density functional theory and quantum Monte Carlo results show that the B12H n and B12F n (n = 0 to 4) quasi-planar structures are energetically more favorable than the corresponding icosahedral clusters and that the fully planar B12F6 cluster is more stable than the 3D counterpart. We have also shown that negative or positive charge further stabilizes the 3D over the 2D B12X6 (X = H, F) clusters (except for B12X62+, where the opposite is observed). Our findings are potentially useful for designing larger boron-based nanostructures starting from quasi-planar or fully planar building blocks. The authors would like to acknowledge the support given by the Robert A. Welch Foundation (grant J-1675), the NSF CREST CRCN center (grant HRD-1137732), and the Texas Southern University High Performance Computing Center (http://hpcc.tsu.edu/; grant PHY-1126251). NGS conceived the study, did the calculations, and drafted the manuscript. CJT conceived the study and revised the manuscript. All authors read and approved the final manuscript.